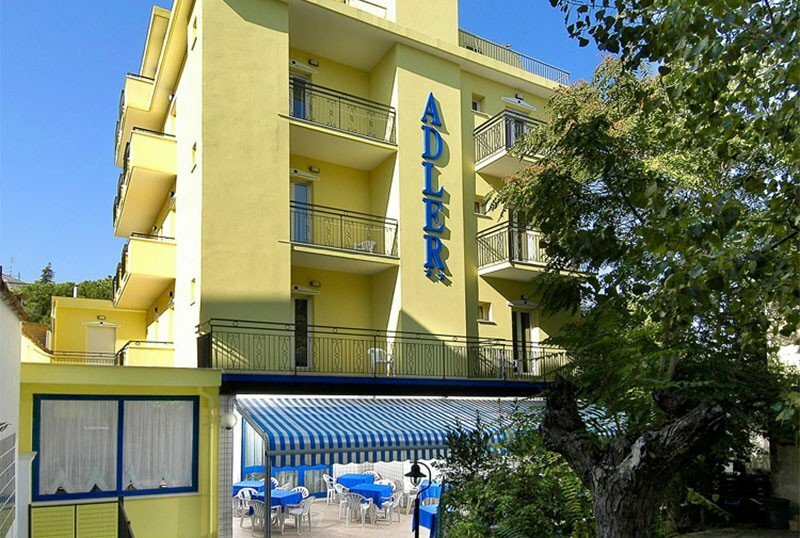 Hotel Adler is a 2-star family-run hotel in Riccione, recently renovated and renovated. It has parking, WI-FI throughout the structure and offers all guests free entry to the Beach Village water park. Accepts small pets. The hotel is located in a quiet area of Riccione, less than 5 minutes walk from the sea and a few steps from Viale Dante. Riccione's swimming stadium can be reached in about 10 minutes on foot. All rooms are equipped with bathroom with shower, balcony, direct dial telephone, courtesy set, WI-FI, hairdryer and satellite TV. Air conditioning is available upon request and subject to charges. Open-air porch with chairs and tables, free use of bicycles, lounge with satellite TV, bar, elevator, luggage storage, night porter, late check out. Theme evenings and organized excursions are planned. PARKING: discovered 600 m to the structure or garage under video surveillance in front of the hotel, both subject to charges. PETS: small pets allowed except for the restaurant. BREAKFAST : sweet savory buffet. LUNCH AND DINNER: Romagnola and vegetarian cuisine with a choice of meat and fish menus accompanied by buffet vegetables. Pasta and desserts are homemade. At meals: bottle warmers, seats at the table, a kitchen for mothers. 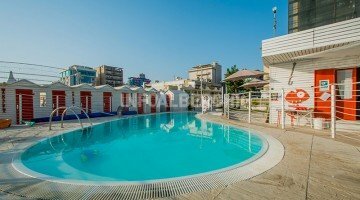 The hotel has an agreement with the Bagno n. 112 where guests can enjoy free booths, entertainment for children and swimming pool with hydromassage.